Since there are no Saabs manufactured for the moment, some of us cling on to what we have. That´s all right, since a well treated Saab will run for a long time. However, there are some issues when a car come of age. One is insurance. Most car insurances have a limit for covering repairs on the engine/machine. There is a big range here. A common limit is at a maximum of 8 years or 100´000 km. Some insurance companies stretch this up to 120´000 km or even higher in some cases. Note that the deductible may raise considerably when the car gets older (check the conditions). Note that this site only compare the content of the insurance, not how well the insurance company actually perform at the event of an issue (except if there is a quality index). I made a call to “Konsumenternas Försäkringsbyrå” in order to check about some of the companies with very good conditions and a very low price. Smaller, newer insurance companies have deals with subcontractors to manage the issues and they do not have a good reputation. You may also need to go to specific repair shops. If you stick with the larger companies there will be no issues getting a damage inspected or finding good repair shop. In the end, you get what you pay for. Folksam, (one of the large insurance companies in Sweden) offer a special insurance for Saab owners. It is a bit pricey, but it covers engine/machine repairs up to 150´000 km or 8 years (which is much better than their normal deal). The deductible is also very low. A bad thing is that they add a cost if you use the car for business trips, which is something I have never experienced before. 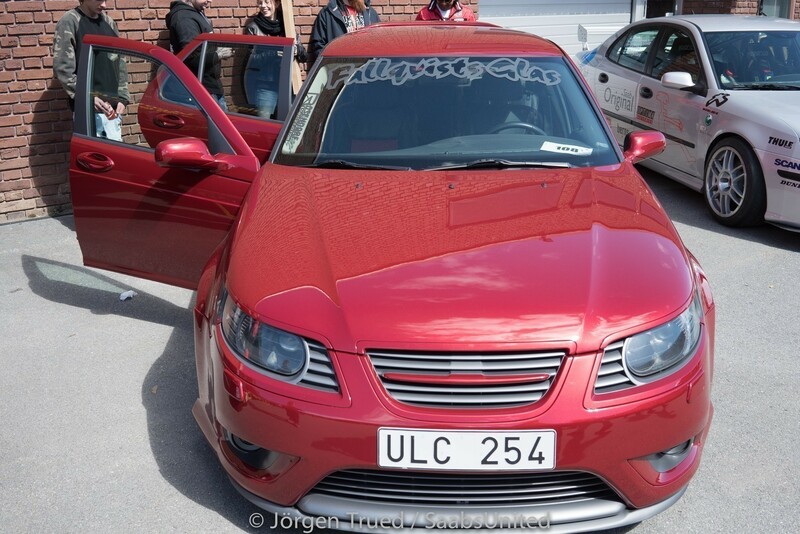 Folksam have undoubtedly realized that Saabs are cars that last long so it’s worth the risk to give better conditions. They also realize that they will attract Saab owners who stick with their brand. I hope more insurance companies understand and do the same (e.g. the Saab Brand Insurance offered by IF). Prices for car insurance differ a lot depending on where you live, what car you have, how old you are and a number of other criteria. Different companies will put you in different segments depending on their specific risk calculation. I would advise you all to check for better deals each year. Drive safe and have a good vacation! In the hometown of Stig Blomqvist the famous SAAB rally driver the MapTun Meet was held again. As always in sunshine outside the MapTun Company HQ. The pictures speaks for themselves. It was a lot of happy people and cars of all ages and even a “new” brand. I served as one of the judges deciding what cars getting the sweepstakes. Above is Joakim Bernhardsson winner of “Best Performance” with his 9-3 Racing Replica. My choice of all the cars at the meeting but You all know I am a “sucker” for everything that is rally or racing historical. Joakim is the first who makes an authentic replica of that racing car. In the heydays the original car was driven by a group of three drivers one of the Peter “Poker” Wallenberg. Most of the company logotypes are from companies in the Wallenberg/Investor conglomerate. Guess some of You rememember the 1980 is ad campaign from Saab talking about the “Most Intelligent Car Ever Built”. Stating that the swedish technology and production was special in some ways. Guess they where right to some extent. Still today a properly restored 99 or 900 OG is a true performance drive and with compared to todays safety standards still as an slightly below average car safety vise . The most intelligent thing to do today with just two Swedish manufacturers of vehicles left, Volvo Trucks and Koenigsegg (Scania Trucks is today a 100% German MAN/Volkswagen company, and ovloV cars is chinese). So this leaves You with three options really if You want to be intelligent. Get a Koenigsegg One:1, a Volvo FH Dual Clutch Tractor or build Yourself a 900/99 car. To make Your decision I have posted a small consumers film here for You. Yesterday, Saturday, we in the Saab Turbo Club of Sweden had a track day at Kinnekulle Ring here in Sweden. When I picked up the car in 2012, in really bad condition as seen. SaabCars is now selling a 4-door Turbo Sedan model of the 9-3 generation II on the swedish market. Saab Automobile production came to an end with the 4-door sedan of the 9-5 generation II. But when did Saab start to sell their very first 4-door sedan with turbo powered engine? For those of You who know Your history books that was with the 900 Turbo sedan in 1981. Well not quite so. There where a few 99 Turbos with rear passenger doors. And that was 4 years earlier. Here is the story and the restoration program. A restoration that You can follow here on SaabsUnited. Hopefully some of you get the inspiration to do something similar to save an old Saab. Some of You have most probably read my prevoious postings on Saab History and classic Saabs. You might recall the Saab 99 Turbo Rally cars I have built and competed with over the last years. Also my recreation of the Pearl white 99 Turbo replica, the very first 99 Turbo from the 1977 Inteational Frankfurt Auto Saloon. That car is now under construction/restoration. One and a half year ago I found a super rare 99 Turbo and to my surprise it was a 4 door saloon. I was at first somewhat reluctant if this was a true 4 door. Saab has never sold the 99 Turbo in that configuration just 2 door sedan and CombiCoupe (Wagonback). I picked up the car in southern Swedish province of Skåne. Then I drove way up north to find a not so rusty donor car, since some parts on the turbo where really rusted out and had damage from a collision. What one of the other 9 4 door cars did look like picture taken from a Saab 99 Turbo sales brochure from 1978. Now I have again started a historical research that has been part of all my car renovations since I always do unusual and spectacular cars. This car was not different in that respect. It was Test vehicle no. 970 in the One-hundred series. Test fleet vehicles that Sab built before the offical launch of the 99 Turbo CC in 1978. Through a good friend who was a manager at Saab-Scania both in Sweden and The US in the heydays, we started a collaborative work to make the registry of the alluring 100 cars as complete as possible. We still work on that list. What we know just about nothing about is the cars sent to europe (EU) excluding Sweden. The 100 cars whare sent to the US, Sweden and rest of europe. Of the 4 doors 10 where made and 5 has survived only one in traffic. The one rolling has been modified extensively, has a history as a track-racer, tuned 16V engine and a Airflowkit registration plates GEM943. Tomorrow, December 10th at 2pm NEVS will start selling the 9-3 Aero Sedan in Sweden over the internet. Last monday they already released some details about that, but today on a press-release they have disclosed further details. The cars will be a fully equipped 9-3 Aero, tomorrow we will know what fully equipped means, and will sell for 279 000 SEK with a manual transmission, and you will have to add 10 000 SEK if you want an automatic transmission. We already knew this, but today they’ve also disclosed, that the price will include a 3 years guarantee, 3 years of service and 2 years of road assist. Although the contract between Orio and NEVS is currently only a “Letter of Intent”, the NEVS Saabs will be serviced by the current Saab genuine service workshops. The first cars will be delivered in spring 2014, and NEVS is already announcing this cars as a “limited edition”. The cars will be delivered at the factory, and the buyers will get to talk with NEVS officials and will also get a factory tour. For my private taste this is a very nice package for a car that despite its age, still looks modern, and with an engine that in 2008 was really good, from the comparisons I made by then. I don’t expect to see the 9-3 in the top places of the Swedish sales statistics, but I’ll will follow the sales numbers as I did in the past. One of our members in the Saab Turbo Club of Sweden, Mikael Öhrman (mioh), have been very nice and put up this great movie from our latest track day within the Saab Turbo Club of Sweden. The movie shows many glimts on what we are doing when it comes to a track day. How we in the steering board of STCS, together with our friends in the Racecrew, are preparing the track the day before. Then some of the activities we are preforming during a track day. Many thanks to Mikael Öhrman for the movie! Stig Blomqvist´s birthday is today! Ex-world champion in rallying Stig Blomquist turns 67 today. He is one of Saabs rally heroes in the Saab heydays. When Saab withdrew from rallying Stig worked with Audi and Ford plus some other brands as well. See list below. A white Saab 96 Sport and with his dad as a co-driver he debuted in rallying in August 1964 and won his Junior class and second in all. The rally included 10 Special Stages (SS) and was 60 km long. Stig is still active in rally and racing, doing historical rallies and supporting his sons in their respectivley racing careers. He is also doing work with S2AB Corp. a company run by Magnus Roland where Stig is the tester of new chassis designs. Volvo 240 Turbo Cup, 240 Turbo ETC. Where do YOU buy Saab spare parts? Aigars Roze on Have you ever had a hard time locking your Saab? Copyright © 2007 - 2019 SAABSUNITED. Managed by Svenska Saabklubben.